The Energy Show and everything you needed to know about Methane! We love the Science Museum, and enjoy visiting the Launchpad gallery which is packed with over 50 interactive exhibits. We visited again last weekend, and were lucky enough to catch The Energy Show again. The boys chuckled and squealed as two futuristic science students race against time to prove their knowledge of all forms of energy. Methane bubbles are set alight to make fireballs and liquid nitrogen freezes a bunch of flowers, ensure your ears are covered – it’s very NOISY! I am proud to say that I REALLY enjoyed your science show called ‘The Energy Show’. My favourite part was the singing Tesla Coil that sang the Darth Vader entry scene music. It got me on the edge of my seat, biting my lip and chewing my nails. I also enjoyed when the crazy student blew up the balloons when she wasn’t supposed to. For the first balloon I didn’t think it would be so loud so I didn’t cover my ears but it WAS quite loud so for the second one I covered my ears and that was even louder. I would recommend it to everybody. Thank you for a fun day, here is my review: If you like bangs pops and explosions look here. The energy show is AMAZING! I’ve seen the show once before but the second time was just as good if not better. There was an amazing singing Tesla coil which buzzed to the tune of the imperial march from star wars whilst giving a amazing lightning show. Plus a bottle launcher which fired bottles into the excited audience. I thought that the science show was amazing and that you should see it too. I think that says enough?! 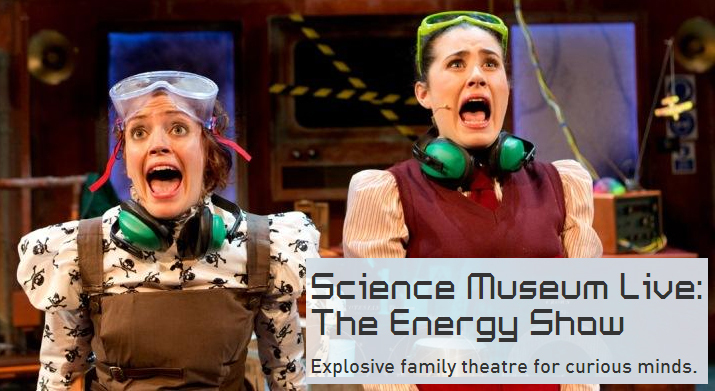 Produced by the world famous Science Museum in London, this show is suitable for everyone aged 7+. Click here to BOOK NOW for the Summer holidays 22 July – 3 August 2014.